When we were little my grandfather watched us a lot while my parents tended to the restaurant. He was always burning memories into our brains. Of the many wonderful memories I keep of him, his Chili is among the favorites. I always requested his ‘special’ Chili when I had friends over and even in the dead of summer. He added rice, which a the time seemed incredibly unusual, and taco seasoning. The flavor was so wonderful and rich and everybody always loved it. Unfortunately, I never did get the exact recipe since I was so young when he passed away, but luckily I remembered his secret ingredient and my grandmother conjured up the rest of the recipe as best as she could remember. I’ve never heard of anybody using taco seasoning in Chili, but man does it add some serious flavor!! Everybody knows Chili is a Fall favorite. As soon as the leaves start to change and the chill of Fall starts to move in, everybody starts craving warmth. 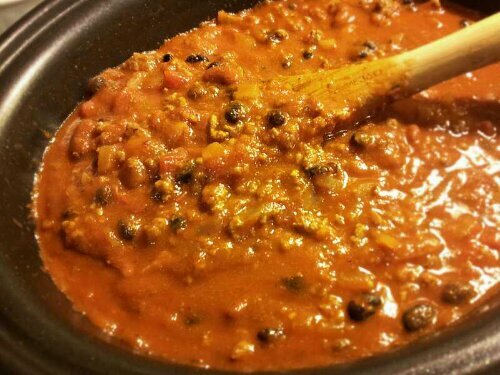 It seems like as soon as it cools down Chili starts becoming a popular item at every restaurant and in every home. I thought this was a good recipe to add to my collection since I’ve made 2 batches already since Fall started and now that I am thinking about it I might just have to make another! I hope everybody will enjoy this Chili as much as my family always has, and will continue to. I also added some hot sausage, your preference what other meats and veggies you add. Cook meat, garlic, and onions. Add remaining ingredients to crockpot. Add in small amounts each to be sure it is mixed well and not too much for your crockpot. I think I have a 7 quart, and this recipe was right to the top and difficult to stir well. I left it on medium heat for 4 hours. Season to taste, feel free to add any other seasonings desired throughout cooking. I like to experiment a little with my Chili! Cook rice on side, add to crockpot before serving or serve separately.